Join us May 4th from 1:00-4:00PM here at the winery as we celebrate the release of our 2018 Rose of Primitivo! At our 6th Annual Spring Open House, we will have a food truck, live music, and (as always!) our award winning wines! Join us on Saturday May 11th from 11AM-3PM. 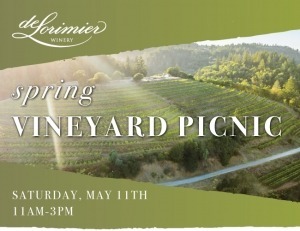 We invite you to attend our annual picnic at the picturesque Wedding Cake Vineyard here in Alexander Valley. Enjoy lunch, wine, and live music. To keep the intimate setting, these events are limited to 14 guests. Saturday seating’s are at 11:30am & 2:30pm. We will be participating in Experience Alexander Valley on June 22 & 23! Saturday Morning-Join owner and winemaker, Diane Wilson, as she guides you through an in-depth sensory experience. Beginning with a lesson on aromas and finishing with a journey into wine and food pairings you will learn techniques that will aid you in your analysis of wine and further enhance your appreciation of the subtle nuances wine can achieve. This fun and educational event will showcase varietals such as Chardonnay, Primitivo and Cabernet Sauvignon. Sunday Afternoon-Join our wine educator as they guide you through an in-depth sensory experience. Beginning with a lesson on aromas and finishing with a journey into wine and food pairings you will learn techniques that will aid you in your analysis of wine and further enhance your appreciation of the subtle nuances wine can achieve. This fun and educational event will showcase varietals such as Chardonnay, Primitivo and Cabernet Sauvignon. To keep the intimate setting, these events are limited to 14 guests. Saturday’s have two seating’s at 11:30am or 2:30pm. Join us for a fun-filled, two day outdoor adventurous wine weekend! Our journey takes place on the American River, where gold was discovered at Sutter’s Mill in 1848. Enjoy two days of rafting down the Class III South Fork which runs through the stunning foothills of the Sierra Nevada Mountains. This area is world-renowned for both its rapids and its serene natural beauty. Let our hosts, EarthTrek Expeditions do all the laboring while you enjoy the ride (beginners welcomed and encouraged!). 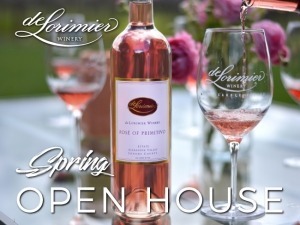 Wine will be the highlight of the evenings, with wines featured from deLorimier, Matrix and Wilson Wineries – all three properties where Diane Wilson serves as winemaker! All weekend you will “Strike it Rich” as you pan for gold on the American River on Saturday morning, enjoy gold medal wines, enjoy a thematic “Gold Rush” party with a sing-a-long at our campsite. All event prospectors will receive special wine discounts. Two days of rafting + two nights of camping + all meals from breakfast Saturday through lunch on Sunday = The Ultimate Weekend! 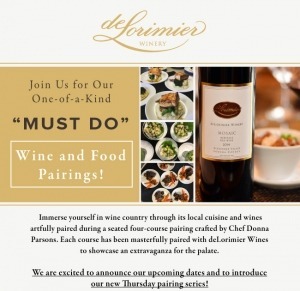 Plus – deLorimier, Matrix and Wilson wines served each evening! Our riverside campsite is situated along the banks of the American River and is inclusive in the package pricing. Bring your tent and sleeping bags from home! EarthTrek Expeditions offers deluxe cabin rentals for an additional charge for those who are interested. Reservations for Cabin tents and River tents are on a first-come firstserved basis and subject to availability.